Back in my childhood days in Ipoh, one of the simplest and most delicious, (at least, to me) soups my mom cooked was Eggs and Mint Leaves Soup. Sounds weird to you all? I love mint leaves. I’m not sure if that’s an “Ipoh thing” but I love lots of it on my curry laksa, assam laksa (of course! ), assam fish, salads… I just love its fresh aromatic flavour. I also know some people absolutely detest mint leaves – they’ll pick it out tediously from whatever dish that’s served with it! Hehe, no worries – just pass them to me. 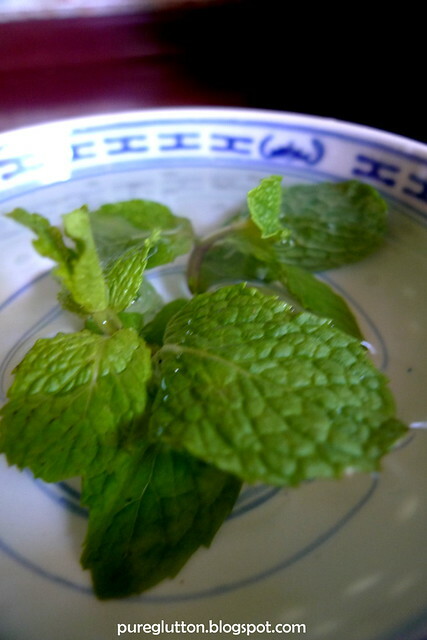 Mint is good for you – it helps to relieve stomach aches – did you know that? Mom used to grow a big tub of mint leaves in the backyard. On days when she’s too busy or there wasn’t much stuff in the fridge, she’d just go pick some mints from the tub and cook them in egg soup for us. Back then life was simple, our needs were basic and one bowl of Eggs and Mint Leaves Soup can go a long way. On days when my mom was too busy, I took over making this soup. It’s really very simple. 1. Fry eggs in some oil. Scramble them up a bit. 2. Add a dash of sesame oil for more aroma! 3. Put in water and boil with the fried eggs for about 3 minutes. 4. Chuck in the mint leaves, season with a dash of salt and serve. I don’t need Chicken Soup for my soul. 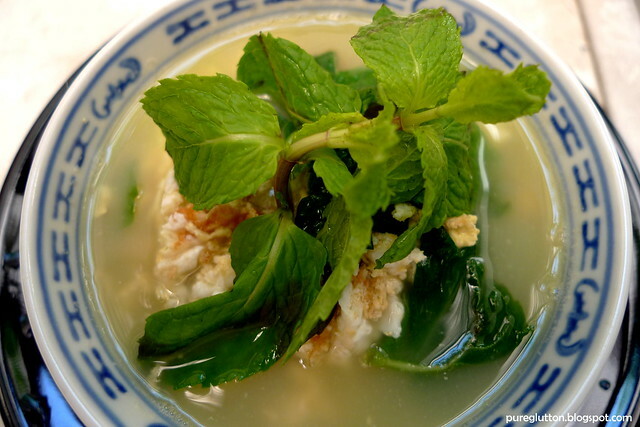 Give me my Eggs and Mint Leaves Soup anytime – it warms not only my tummy, it’s good for the heart and soul. I’d like to submit this for Babe in the City_KL’s annual Merdeka Open House and the theme this year is “Food from our Hearts”. Min: Yeah, it's really very easy, almost like cooking instant noodles! I just had a bowl of this today – so satisfying! Thank you for participating in this year's Merdeka Open House. I usually make this soup using the Thai basil leaves which is good as well. Will try using mint leaves next time. I love eggs and mint leaves soup – not done it in ages! I usually use the egg drop style though, not frying the eggs, and if I'm hardworking, ikan bilis for the stock! Simple yet so satisfying! Thxs for the simple recipe and those cherished moments with yr mother making it. Happy Merdeka! LOL, I think this is really an "Ipoh thing"! My mom used to cook this too, but instead of using plain water, she used the stock from boiling the anchovies and crack the egg into the soup after adding the mint leaves. My favourite egg soup involves equal parts water and equal parts Chinese Rice Wine. Hehehe, but then again…that's the alcoholic in me speaking out! Jason: Ahh, u do agree this is an Ipoh thingy hoh! Mint leaves rock! Unka: That sounds like the "Confinement" version, no? Plus lots of ginger? !